Capital Punishment or Capital Reward? When Betsy DeVos was nominated to head the Department of Education, the main concern was what harm a “choice” crusader would bring to K-12 public schools. Recently we’ve seen that she can also cause damage with regard to post-secondary education. DeVos announced plans to delay the implementation of rules on for-profit colleges that the Obama Administration fought long and hard to bring into being. Calling the plan unfair, DeVos said she wants to redo the rulemaking process from scratch – a clear sign that she wants to weaken or eliminate the restrictions. That’s the premise of a lawsuit just filed against DeVos by the attorneys general of 18 states and the District of Columbia. The Obama campaign against predatory colleges was one of the most consequential initiatives of the administration on corporate misconduct. In addition to the rules – one of which is designed to bar federal loans at schools whose graduates don’t earn enough to pay off their debt and another that would make it easier to erase debt incurred at bogus institutions – the Obama Education Department and the Consumer Financial Protection Bureau brought enforcement actions that helped bring about the demise of flagrant abusers such as Corinthian Colleges and ITT Educational Services. And this came after the Obama Administration pushed Congress to get commercial banks out of the student loan business. Taken together, the Obama era measures against predatory for-profit education represent one of the rare instances in which government action targeted not just an illegitimate practice or a miscreant company but an entire industry. The message was not simply that for-profit colleges needed to be reformed but rather that they should not continue to exist. It was capital punishment for capital. It comes as no surprise that the billionaire DeVos, who has had personal involvement with dubious business ventures, is seeking to undo the crackdown on for-profit colleges. And it is yet another example of how the Trump Administration is working against the interests of those lower-income voters who put him in office. The same dynamic can be seen in the healthcare arena. The Republican “solution” to the problems of the Affordable Care Act is to make it easier for insurance companies to offer bare-bones junk insurance while dismantling Medicaid, both in its traditional form and its expansion under the ACA. The latest version of the Senate bill is willing to retain the hated taxes on high-income earners as long as the assault on the socialistic Medicaid program moves forward. It appears that the right’s desire to protect the interests of corporations – including the most predatory – is even greater than its wish to redistribute income upward. Thus the one thing that Republicans have made sure to do with their stranglehold on the federal government has been to roll back as many business regulations as possible. It remains to be seen how long Trump and Congressional Republicans can get away with telling their working class supporters that predatory corporations are the ones that deserve relief. Posted in Healthcare, Privatization, Regulation | Comments Off on Capital Punishment or Capital Reward? The outcome of most cases of serious corporate misconduct is the same: the company pays a fine that is not too onerous and no one ends up behind bars. That’s what makes the fate of ITT Educational Services all the more significant. This for-profit educational outfit just shut down pretty much all its facilities in the wake of a recent announcement by the U.S. Department of Education that the company would no longer be able to enroll new students using federal financial aid funds. In other words, the feds effectively put ITT out of business. ITT is not the first dubious for-profit educator to be pushed into oblivion. In 2015 Corinthian Colleges announced the cessation of operations amid a spate of state and federal investigations, including a CFPB case that resulted in a default judgment of $530 million. To its credit, the Obama Administration has stood fast in its tough treatment of scam schools, building on the 2010 move by Congress to push commercial banks out of the federal student loan business. The willingness to put sleazy operators out of business is seen little outside the educational sector. It’s true that the Bureau of Prisons announced plans to phase out the use of private prison operators, but the likes of CCA will be kept alive by their state government customers. Among federal regulators, the one agency that focuses more on shutting down rogue operators rather than imposing monetary fines is the Food and Drug Administration. It must be noted, however, that the shutdowns are often temporary (remaining in effect only while the company corrects unsafe processing plant conditions) and usually involve smaller firms. Other agencies may take action that results in the closing of fly-by-night firms, but it is rare for regulators or prosecutors to take steps that could end up in the demise of an established company, no matter how corrupt it may have become. This hesitation seems to stem from backlash against the Justice Department’s case against accounting firm Arthur Andersen for its role in the Enron accounting scandal. In the wake of its 2002 conviction for obstruction of justice, the firm had to dismantle its auditing business and was unable to resurrect it after the Supreme Court overturned the conviction three years later. Nonetheless, the Enron accounting fraud was real, and Arthur Andersen enabled it in some way. It is time for the DOJ and other regulatory agencies to follow the Education Department’s lead in taking the most aggressive kind of action against big companies that misbehave in a major way. A prime candidate for such treatment is Volkswagen, which engaged in a brazen scheme to cheat auto emissions tests and thus exacerbated air pollution to a shocking extent. The company is paying billions in settlement costs but apparently will remain in business. In fact, it just announced a substantial investment in Navistar to boost its position in the U.S. truck business. A move to mandate the shutdown of a large company like VW should include arrangements for the sale of its assets and other protections for its workers. There would still be disruptions but it would send a strong signal to other large corporations that they should not expect to buy their way out of severe legal liability. The decision by the Justice Department to end its use of privately operated prison facilities is a long overdue reform and one that should also be adopted by the states. Yet the for-profit prison scandals are not limited to those involving companies such as Corrections Corporation of America that are in the business of managing entire correctional facilities. There is also now a widespread practice of contracting out specific functions at government-run prisons, often with disastrous results. Numerous states and localities have, for instance, handed over responsibility for feeding prisoners to large foodservice companies such as Aramark operating under lucrative contracts. Like other providers of outsourced services, Aramark has made grandiose promises about the savings that private operation would provide. Many public officials, especially conservative governors looking to shrink the size of the state workforce, have taken these claims at face value and ignored the dismal track record of privatization. A case in point is Michigan, where in 2013 the administration of Gov. Rick Snyder gave Aramark a three-year contract worth about $150 million covering the state’s correctional facilities. The plan eliminated some 370 state jobs and was supposed to save $12 million a year. At one point the state department of corrections fined Aramark $86,000 for violations of the terms of its foodservice contract and another $12,000 for fraternization between company employees and prisoners, but those fines were quietly cancelled. Later the state imposed another $200,000 in fines that apparently were collected. Yet a former Aramark worker later filed a whistle-blower complaint alleging that she was fired for objecting to the falsification of records about unhygienic kitchen practices. In 2015 the state bowed to public pressure and terminated Aramark’s contract. Michigan is just one of numerous states in which Aramark’s performance under correctional foodservice contracts has been less than sterling. In 2000 it was reported that Aramark secretly negotiated with state corrections officials in Ohio to obtain $1.5 million in additional payments on a pilot contract to provide food services at the Noble Correctional Institution, even though other state officials were recommending that the contract be rebid. In the wake of the controversy, the state decided to return the function to public control yet later switched course. In 2013 Aramark won a foodservice contract for the state’s entire prison system. The following year the company was fined $142,100 for violations that included failing to hire enough employees. More fines followed, including a $130,200 penalty for ongoing problems such as food shortages and a lack of cleanliness. A 2007 audit by the Florida Department of Corrections Inspector General of Aramark’s contract to provide foodservice for the state’s prisons found that the company was serving fewer meals than anticipated and was using less costly ingredients but was not passing along the savings to the state. Officials later fined the company more than $240,000 for slow meal delivery, insufficient staffing and other violations. In 2013 investigative journalist Chris Hedges reported that Aramark served spoiled food to inmates at prisons in New Jersey. 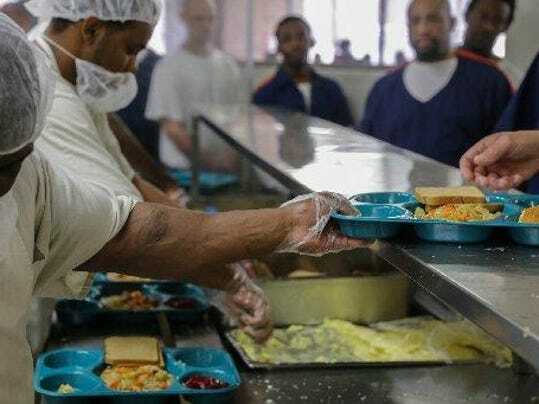 There was a time when much of the public was indifferent to prison conditions and cared little whether inmates were being food that was inedible. But now that there is much wider understanding of the problem of over-incarceration, we need to make sure that those still behind bars are treated with dignity and not abused by privateers. Note: this post draws from my new Corporate Rap Sheet on Aramark, which can be found here. The Obama Administration has done the right thing in forgiving the debts of students who attended the schools run by Corinthian Colleges, the for-profit education racket that recently shut down and filed for bankruptcy amid widespread charges of fraud and a $30 million federal fine. Yet the action should have come much sooner and should be much wider in scope. Over the course of 20 years, Corinthian, once a Wall Street darling, built an empire of some 100 schools offering dubious post-secondary career training programs to hundreds of thousands of students across the country. The company deceived applicants into signing up for expensive degrees of questionable value in landing good jobs, much of which made possible by the availability of what amounted to predatory federal student loans. There have been questions about Corinthian’s practices for more than a decade. By 2004 the company was being investigated by the U.S. Department of Education and the attorney general of California, where the company was based. A narrowly focused SEC probe went nowhere, but more state cases were launched, along with student-initiated lawsuits. California finally brought suit against Corinthian in 2013, accusing it of false and predatory advertising, securities fraud and intentional misrepresentations to students. At the same time, however, a federal appeals court ruled that the plaintiffs in the separate student lawsuits had to take their claims to arbitration, a process known for favoring corporations. In 2014, under pressure from federal and state regulators, Corinthian began selling off its campuses or phasing them out. The company was then sued by the federal Consumer Financial Protection Bureau for illegal predatory lending. This helped bring about an announcement by Zenith Education Group, which had purchased many of Corinthian’s remaining properties, that it would forgive 40 percent of outstanding student loans. Yet that was not enough. There were growing calls to cancel all the debt of Corinthian students. Some of those students did not wait for officials to act; they launched a debt strike. It was in this context that the Obama Administration’s action finally came, though the strikers are disappointed that the Education Department is not simply discharging the debt outright but is instead setting up a bureaucratic application process. It may be hard to believe but there was once a movement called Wages for Students, which argued not only that those in school should not have to take on debt but they should in fact get compensated for the time spent being prepared to be more useful for a future employer. That view lost out to the ideology of personal responsibility and the mistaken notion that the average person can borrow his or her way to prosperity — a notion was exploited by predatory operators such as Corinthian using the federal government as their enablers and their collection agencies. It is a positive development that the discussion has shifted from simple debt alleviation to the alternative of debt cancellation, but the process should not stop with Corinthian, which was egregious but not unique. There are plenty of other for-profit educational companies that have saddled students with debt for degrees of questionable value, or in many cases no degree at all. The federal government did a lousy job addressing the predatory lending in the housing sector that contributed to the financial meltdown and seriously damaged the economic well-being of much of the population. Now it should make up for that failing by doing an aggressive and thorough job of eliminating abusive student debt once and for all. “We are committed to using our resources to increase opportunity, protect the environment, advance education, and enrich community life.” That declaration comes from the chief executive of the computer systems company Oracle, which is featured in a new report on spending by large companies on corporate social responsibility, or CSR. Statements like this, which are de rigueur these days in corporate communications, seek to give the impression that big business is largely a philanthropic endeavor – that the pursuit of profit and community betterment are not only consistent but are often indistinguishable from one another. The report on CSR spending was prepared by the consulting firm EPG on behalf of the Business Backs Education campaign, which is based in Britain – where CSR is an even bigger deal than in the United States – and is said to be “led by UNESCO, the Varkey GEMS Foundation, and Dubai Cares under the auspices of the Global Education and Skills Forum.” Bill Clinton has lent his name to the effort. I was unable to find a copy of the full report posted online, so I am depending on a summary published by the Financial Times. The main finding is that U.S. and UK companies in the Fortune Global 500 spending about $15.2 billion a year on CSR activities. It’s not clear whether that number is supposed to be impressive, but it is worth noting that the 128 U.S. companies on the list alone account for $8.6 trillion in annual revenue. But even more significant than the amount of CSR expenditures is what they are being spent on. According to the report, 71 percent of the spending by U.S. companies consisted of in-kind contributions, often consisting of the firm’s own products. Oracle, which the FT calls “one of the biggest CSR spenders,” is said to grant “its software to secondary schools, colleges and universities in about 100 countries.” Pharmaceutical companies often donate their own drugs. Not only is such in-kind giving much cheaper than cash contributions – it also serves to promote the company’s products. The giveaways are in effect marketing campaigns to raise the profile of and increase the future demand for those products. EPG appears to have used a narrow definition of CSR, consisting of spending that is more commonly defined as philanthropic. CSR also includes broader initiatives on issues such as the environment. Such activities present another set of problems, given that those voluntary initiatives are often used by business as a way of thwarting more rigorous regulatory oversight. The report is part of the Business Backs Education effort to get corporations to increase the portion of their CSR spending that goes to education. That sounds like a worthwhile mission, but when you look at who is behind the campaign, it all seems somewhat less altruistic. One of the key backers is the Varkey Gems Foundation, which was established by Sunny Varkey (photo), a Dubai-based entrepreneur who founded and runs Gems Education, the largest operator of private schools in the world and a for-profit provider of services to public schools. Forbes estimates Varkey’s personal wealth at $1.8 billion. In other words, Varkey is pushing corporations to contribute more to educational budgets that in many cases will be spent on purchasing services that will enrich him and his company even more. And he’s doing this under the banner of CSR and with the imprimatur of UNESCO and the former president of the United States. From the findings of the EPG report to Varkey’s broader plans, all this is a glaring example of how much of CSR is a sham, a way for large companies and the superrich to promote their self-interest while pretending to be humanitarians. Public employees used to be known as civil servants, and the way things are going that label is becoming more and more accurate. The 5 million people employed by state governments and the 14 million employed by local governments are under attack in a variety of ways, and the U.S. Supreme Court may soon provide the crowning blow. Going after public employees — even firefighters and other first responders — became a popular sport in the wake of the Republican gubernatorial victories of 2010. Wisconsin Gov. Scott Walker and his allies in the legislature defied mass protests (photo) and pushed through a law gutting public employee collective bargaining rights. Tennessee and Idaho enacted laws restricting bargaining rights for public schoolteachers. Ohio’s legislature curbed those rights for all state employees, but the move was repealed in a 2011 referendum. At the same time, fiscal austerity measures led to widespread layoffs even among those public workers who did not lose their union protections. Between 2009 and 2013 state and local governments shed around half a million jobs, which has been a blow not just to those let go but also to the national economy. The private sector recovery has been held back by the ongoing slump in much of the public sector. There are other pernicious forces at work. A new report by In The Public Interest describes the ways in which the outsourcing of public functions “sets off a downward spiral in which reduced worker wages and benefits can hurt the local economy and overall stability of middle and working class communities.” Using examples involving functions such as nursing, food service, trash collection and prisons, the report brings together data showing how job quality can plummet after the work is contracted out. For example, it notes that private-sector trash collectors earn around 40 percent less than their public sector counterparts. Wages are not the only way in which privatized jobs are inferior. Slashing retirement benefits is one of the key ways that outsourcing companies achieve “savings.” Those who remain on public payrolls are also finding their pensions under assault. Led to believe that retirement costs for government workers are out of control, governors and legislators in numerous states have been moving to cut benefits, tighten eligibility requirements and push now hires into 401(k)-style defined contribution plans instead of traditional and more secure defined-benefit coverage. As if all this were not bad enough, public employee unions are facing a legal challenge that could undermine their ability to survive. The Supreme Court is expected to rule this month on a case called Harris v. Quinn, which started out as a narrow dispute over the obligation of home health care workers to pay agency fees to unions that bargain on their behalf. That case was concocted by the vehemently anti-union National Right to Work Foundation, which by the time the matter was heard by the Supreme Court in January was arguing that decades of settled law on the collective bargaining rights of all state and local employees should be scrapped. This position was so audacious that even Justice Scalia seemed to have a problem with it. Yet other conservatives on the court as well as the man-in-the-middle Justice Kennedy seemed to be open to the idea. This could set the stage for a reprise of what happened in Citizens United: the transformation of a narrow case into a broad ruling with disastrous consequences. The consequences being sought by the “right to work” crowd go far beyond the enfeeblement of public sector unions. They also want to dismantle the political influence of public sector unions, which are a key source of support for the Democratic Party and for progressive public policy. As Jay Riestenberg and Mary Bottari point out in PR Watch, the National Right to Work Committee has long had deep connections with rightwing players ranging from the John Birch Society to the Koch Brothers. The ties with the latter are an indication that the “right to work” forces are not hurting for money. While enjoying their own solid funding, they are seeking to undermine the money flows which unions depend on to pursue their mission. In an era in which, as the Supreme Court has declared, money is free speech, the Right is doing everything in its power to silence workers and their representatives. Canada’s Transportation Safety Board is far from reaching a conclusion on what caused an unattended train with 72 tanker cars filled with crude oil to roll downhill and crash into the Quebec town of Lac-Megantic, setting off a huge explosion that killed at least 15 people. But that hasn’t stopped Edward Burkhardt, the chief executive of the railroad, from pointing the finger at everyone in sight — except himself. Burkhardt first tried to blame local firefighters who had extinguished a small blaze in the train before the larger accident, and now he is accusing his own employee — the person who was operating the train all by himself — for failing to apply all the hand brakes when he parked the train for the night and went to a hotel for some rest after his 12-hour shift. Whatever were the immediate causes of the accident, Burkhardt and his company — Montreal, Maine & Atlantic (MMA) Railway and its parent Rail World Inc. — bear much of the responsibility. Burkhardt is a living symbol of the pitfalls of deregulation, deunionization, privatization and the other features of laissez-faire capitalism. He first made his mark in the late 1980s, when his Wisconsin Central Railroad took advantage of federal railroad deregulation, via the 1980 Staggers Rail Act, to purchase 2,700 miles of track from the Soo Line and remake it into a supposedly dynamic and efficient carrier. That efficiency came largely from operating non-union and thus eliminating work rules that had promoted safety. Wisconsin Central — which also took advantage of privatization to acquire rail operations in countries such as Britain, Australia and New Zealand — racked up a questionable safety record. Burkhardt was forced out of Wisconsin Central in a boardroom dispute in 2001, but he continued his risky practices after his new company, Rail World, took over the Bangor and Aroostook line in 2003 and renamed it MMA. Faced with operating losses, Burkhardt and his colleague Robert Grindrod targeted labor costs with little concern about the safety consequences. In 2010 the Bangor Daily News reported that MMA was planning to reduce its crews to one person in Maine, which, amazingly, was allowed by state officials. Grindrod blithely told the newspaper: “Obviously, if you are running two men on a crew and switch to one man, you’re saving 50 percent of your labor component.” The company also succeeded in getting permission for one-man crews in Canada. Inadequate staffing may have also played a role in a 2009 incident at an MMA maintenance facility in Maine in which more than 100,000 gallons of oil were spilled during a transfer in the facility’s boiler room. In 2011 the EPA fined the company $30,000 for Clean Water Act violations. MMA continued to have safety problems even before the Lac-Megantic disaster. The Wall Street Journal reported that MMA had 23 accidents, injuries or other reportable mishaps from 2010 to 2012 and that on a per-mile basis the company’s rate was much higher than the U.S. national average. The Lac-Megantic accident is prompting calls in Canada for a reconsideration of the policy of allowing a high degree of self-regulation on the part of the railroads. A review of lax regulation, including the elimination of work rules, should also occur in the United States. There’s also a scandal in the fact that railroads like MMA are still allowed to use outdated and unsafe tanker cars. Yet some observers are seeking to exploit the deaths in Quebec by making the bizarre argument that the real lesson of the accident is the need to rely more on pipelines rather than railroads to carry the crude oil gushing out of the North Dakota Bakken fields (the content of the MMA tankers) and the tar sands of Canada. North Dakota Senator John Hoeven, for instance, is using the incident to argue the need for the controversial XL Pipeline. How quickly these people forget that the safety record of pipelines is far from unblemished. Hoeven’s neighbors in Montana are still recovering from the 2011 rupture of an Exxon Mobil pipeline that spilled some 40,000 gallons of crude oil into the Yellowstone River. The problem is not the particular delivery system by which hazardous substances are transported but the fact that too many of those systems are under the control of executives such as Burkhardt who put their profits before the safety of the public. After holding out as long as possible in the hope that Mitt Romney would be elected and the Affordable Care Act would be repealed, various red states are now being forced to decide whether they will set up the insurance exchanges mandated by the act or let the federal government do it for them. While this is a defeat for die-hard opponents of Obamacare, it is a windfall for a group of companies that regard the exchanges as a huge business opportunity. Those companies are not just the private health insurance carriers, whose continued existence was guaranteed by Obamacare’s rejection of both single payer and the public option, and whose services will be hawked on the exchanges. It turns out that the creation of the exchanges, whether done under the auspices of a state or the feds, will involve private contractors. Some of the states that have already opted to set up their own exchanges are doing so with the help of corporations that make a business out of government services. For example, California awarded a $359 million contract to consulting giant Accenture. Xerox got a $72 million contract from Nevada, and Maximus was awarded $41 million by Minnesota. Maximus is also reported to be among those companies competing for a federal contract that may be awarded to help the tardy states catch up. This would be in addition to several hundred million dollars in contracts already awarded by the Department of Health and Human Services to three contractors to help build the federal exchange. While it is dismaying to see large amounts of taxpayer money going to the private sector for what is supposed to be a public service, it is even more dismaying to see which companies are at the front of the gravy train. Take the case of Maximus, which was established in the 1970s but whose business really took off in the wake of the welfare “reform” of the 1990s. Among other things, the Personal Responsibility and Work Opportunity Act opened the door to state government use of contractors to administer public assistance and other social programs. The annual revenues of Maximus soared from $88 million in 1995 to $487 million in 2001. That was great for its executives and shareholders, but taxpayers and participants in the social programs the company helped administer were often less enthusiastic. Maximus ended up at the center of one controversy after another as its performance faltered and its promises of vast savings from contracting-out frequently failed to materialize. For instance, after Maximus took over In Connecticut’s program of child-care benefits for poor families in 1996, the system soon fell into such as state of disarray that the New York Times published an article about the situation headlined IN CONNECTICUT, A PRIVATELY RUN WELFARE PROGRAM SINKS INTO CHAOS. In Wisconsin, where former Gov. Tommy Thompson put Maximus in charge of the state’s welfare-to-work program, a legislative audit found that the company was using public money for unauthorized purposes such as staff parties. At the same time, Maximus was found to be doing a poor job in getting clients into full-time jobs. Maximus has also been accused of filing false claims with the federal government for its state and local clients. In 2007 the company had to pay $30.5 million to resolve Medicaid fraud charges related to its contract with the District of Columbia. In Texas, Maximus was embroiled in a scandal relating to work directly relevant to health insurance exchanges. In 2005 the Texas Access Alliance, an entity formed by Accenture and Maximus, received a whopping $899 million contract from the state to develop a social services enrollment system. It turned out to be a disaster. There was a high volume of glitches in the computer system and poor performance by the related call centers. The Alliance eventually lost the contract and was sued by the state. The case was settled under a deal in which the Alliance agreed to forgo $70.9 million in payments and Maximus agreed to pay $40 million in cash and provide a $10 million credit against future work. The rollout of the Obamacare insurance exchanges is already operating on a tight deadline. It is difficult to believe that the situation will get better by putting companies such as Maximus and Accenture in the picture. Using these contractors may instead provide more evidence of the Affordable Care Act’s dangerous dependence on the private sector. New in CORPORATE RAP SHEETS: a dossier on Dow Chemical and its sordid history of napalm, Agent Orange, dioxin and Bhopal. If you’re focused on the BP settlement and want a reminder of the company’s long list of sins, see the fully updated BP Corporate Rap Sheet. As unemployment rates remain stubbornly high around the country, the Republican winners of November’s gubernatorial races face a dilemma: How do they respond to the clamor for more job creation while holding true to their opposition to government activism. The answer, apparently, is to go with a gimmick. In at least four states, the gimmick consists of proposing that the state agency responsible for business recruitment—and other functions such as awarding subsidies that come under the rubric of economic development—be handed over to the private sector. Governors in Wisconsin, Ohio, Iowa and Arizona are calling on legislators to approve the dismantling of commerce or development agencies and the transfer of their responsibilities—and their funding—to public-private partnerships (PPPs). It turns out that economic development privatization is nothing new. My colleagues and I at Good Jobs First have completed an analysis of the subject, which we’ve just published in a report titled Public-Private Power Grab. We found that the idea is far from new but it is not a common or standard practice. Economic development PPPs date back more than 20 years, but only seven states currently allow private entities to control their business recruitment functions: Florida, Indiana, Michigan, Rhode Island, Utah, Virginia and Wyoming. Several other states previously employed PPPs but abandoned them because of performance problems. Two of the features of the PPPs that promote corruption are that, in addition to public funding, they accept contributions from corporations and that their boards are often chosen by the governor will little or no legislative oversight. What this means is that the PPPs may end up favoring those contributors in making subsidy awards, and those awards are likely to go to the governor’s major corporate campaign donors. Such sleazy practices have been seen most clearly in Texas, where the state’s Emerging Technology Fund is run by a public-private partnership controlled by Gov. Rick Perry and has a tendency to give its subsidy awards to Perry’s donors. According to an investigation by the Dallas Morning News, those donors have collected more than $16 million from the fund. Aside from corruption, the PPPs tend to be characterized by incompetence or poor judgment. For example, the Michigan Economic Development Corporation (MEDC) found itself in hot water last year when it was revealed it had approved a $9 million subsidy to a company headed by a convicted embezzler and scam artist. Not surprisingly, our report concludes that economic development PPPs are a bad idea. Unfortunately, advocates of privatization in this area and others have a tendency to ignore evidence and persist in their misguided belief that the private sector can always do everything better. Key portions of the $787 billion American Recovery and Reinvestment Act, especially the state fiscal stabilization fund, are designed to prevent job loss among teachers and other state and local government employees. But what about the rest? The assumption seems to be that most of the job creation and retention will take place in the private sector. Yet one question that has received little attention since ARRA was signed by President Obama in February is whether the spending will contribute to the process of privatization and contracting-out of functions previously performed by public sector workers. On October 15 the Recovery Accountability and Transparency Board released the first batch of recipient reporting data covering some $15 billion in direct federal contracts. Although this is a small portion of overall ARRA spending (information relating to the much larger realm of federal grants to states and others will be released on October 30), it begins to shed some light on the privatization question. My colleagues and I at Good Jobs First have been examining the universe of around 9,000 recipient reports summarized in a national spreadsheet available on the Recovery.gov website. Many of the entries are unremarkable. They involve contracts for functions such as manufacturing and construction that have traditionally been concentrated in the private sector. It is not surprising that the federal government gave an ARRA contract to Chrysler to supply vehicles and one to Clark Construction to build a new headquarters for the Coast Guard. Yet many of the other entries appear to be part of the contracting-out phenomenon. You can tell this, first, by looking at the names of the contractors: one firm called Federal Contracting Inc. leaves little doubt as to its orientation. There are others that have a reputation for being involved in high-profile outsourcing deals. An example is IAP Worldwide Services, a politically connected firm (former Vice President Dan Quayle is on its board of directors) that got a controversial contract to take over management of the Walter Reed Army Medical Center in Washington. To be a bit more systematic in our analysis, my colleagues and I decided to match the Recovery.gov list of contractors to the membership list of the Professional Services Council, the leading trade association for the federal outsourcing industry. PSC’s members range from large and notorious contractors such as KBR (formerly the Halliburton subsidiary Kellogg, Brown and Root), Xe Services (formerly Blackwater) and CACI International (linked to the Abu Ghraib torture scandal) to small and obscure consulting firms. During its 27-year history, the association has sought to banish the use of the term “Beltway Bandit” to refer to federal contractors and has pushed for legislation that would maximize the amount of federal work that gets outsourced. It has also resisted the recent move toward insourcing. We found that, of the 382 PSC members listed on the association’s website, about 50 are on the list of ARRA federal contract recipients (name variations make an exact count difficult). In all, these members and their affiliates have been awarded about 250 ARRA contracts with a total value of more than $800 million. Some of these involve engineering and construction services, but others deal with functions that are more inherently governmental, such as a contract given to Deloitte Consulting to provide “program management oversight” for ARRA grants made by the Federal Aviation Administration. In an economic crisis such as the current recession, all job creation is to be welcomed. But it would be a shame if some portion of Recovery Act money is being used in ways that do little more than shift work from the public sector to the private sector. Update: I should have mentioned that KBR and Xe Services are not among the recipients of ARRA contracts, but CACI has two. Further update: We spent more time analyzing the spreadsheet and found many more ARRA contracts that can be attributed to PSC members through joint ventures, affiliates, etc. Our tally is now about 470 contracts worth a total of about $3.5 billion. These include some huge contracts associated with clean-up projects at Department of Energy nuclear facilities.